CNG: Printed Auction CNG 75. Marius. Romano-Gallic Emperor, AD 269. 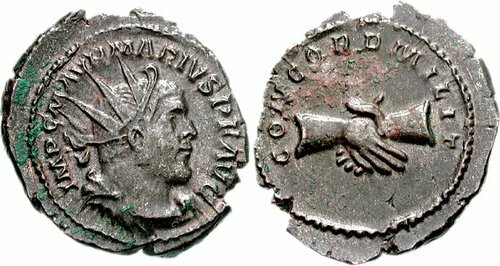 Antoninianus (4.37 g, 12h). Mint I (Treveri [Trier]). 1st emission. Sale: CNG 75, Lot: 1119. Estimate $500. Marius. Romano-Gallic Emperor, AD 269. Antoninianus (4.37 g, 12h). Mint I (Treveri [Trier]). 1st emission. Radiate, draped, and cuirassed bust right / Clasped hands. RIC V 5; Mairat -; AGK 1a. Good VF, brown surfaces, traces of green and red deposits. Struck on an oversized flan. This style portrait struck only from this obverse die. Rare.